After three events, hundreds of participants, and well over 1,300 meetings, we have decided to move on and pursue other projects in the industry. 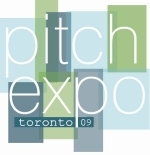 We devoted a great deal of time and energy to make Pitch Expo such a success and couldn't be happier with the results. We are proud of the initiative and are delighted to have brought such an event to the Toronto industry. It's been a privilege to bring such a diverse group of people together to further their creative pursuits. We wish everyone great success in their future projects!